Larry Fischer of GetYourDomain.com is one of the most successful domain investor/brokers of all time but the personable industry veteran’s fame may soon spread far beyond our relatively small corner of the Internet. 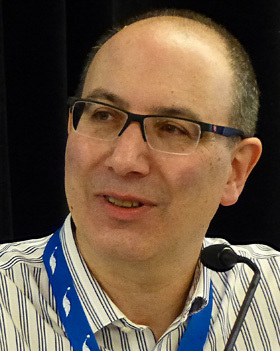 At THE Domain Conference a few weeks ago in Fort Lauderdale, Florida, Larry wowed a lot of people (including me) when he showed them an early demo version of an exciting new web service called SiteChat that he and two co-founders have just launched in beta. SiteChat makes it possible for web surfers to chat with like minded people on any site on the net, even if a site doesn’t offer chat! People visiting the same site can converse in the SiteChat box via text with all of their fellow SiteChat users or one to one via text or video in a private room. The latter makes SiteChat a useful alternative to Skype. the browser version you just go to SiteChat.com, type in the URL you want to visit and click Go which will open up a chat box, along with the site, that will list others who are there and available to chat. The SiteChat box (called Shoutbox) has a Trending button that will show which sites currently have the most active chat activity underway. There is also a Friends button that allows you to send Friend requests. Those on your Friends list are then accessible no matter what URL they are on at the time. You can also search the web from within the Shoutbox by just typing in a new URL or just a topic you are interested in (like domains). 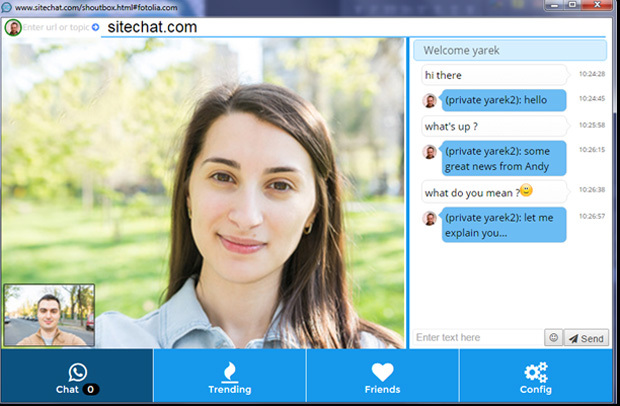 Screenshot of a SiteChat box showing a private video chat session underway. While SiteChat opens up all kinds of possibilities for people and companies all over the web, Fischer would like to focus users on domain industry sites to study and improve the product while it is in beta. It will be easier for people to see the advantages of the platform when large enough numbers coalesce in popular locations and create a lively environment. Larry believes SiteChat is a perfect social tool for domain investors. As one example, you could go to a live auction site and discuss names up for bid, the pros and cons of each, the prices being fetched, etc. Website operators can also make SiteChat accessible to visitors who use Chrome or Firefox by putting a button on their website that will open a SiteChat window showing other SiteChat users who are on the site, making it easy to strike up a conversation. Website operators can also host a scheduled chat inviting people to get together at a specific date and time. Fischer said SiteChat plans to add moderating tools as well for site owners who want to cultivate their own chat community. Down the line, Fischer expects there will be a SiteChat app tailoring the service for mobile use. Right now, he is encouraging all of his friends in the domain world to give it a try and invites you to send your feedback to him (Larry at GetYourDomain.com). You are also likely to run into Larry on SiteChat itself as the word gets out and users begin to multiply. Having looked at it myself I have to believe this could the start of something big.